Here comes The Kingdom! Showrunner Scott Gimple had a chat with EW about the newest post-apocalyptic community to be revealed on The Walking Dead, come this October. What makes The Kingdom different from Alexandria or The Hilltop? It’s just better, he says. I’ll say that the Kingdom is a place that works and it’s a place that has a very different vibe because it works. They’ve figured out how to feed themselves. They’ve figured out how to have a place that in many ways celebrates life. They get to be alive. They want to live. It isn’t merely about survival. A big element of The Kingdom and what makes it tick is its loud, boisterous ruler, the bearded Ezekiel. Gimple talks about how his presence possibly inspires the community to work the way it does. 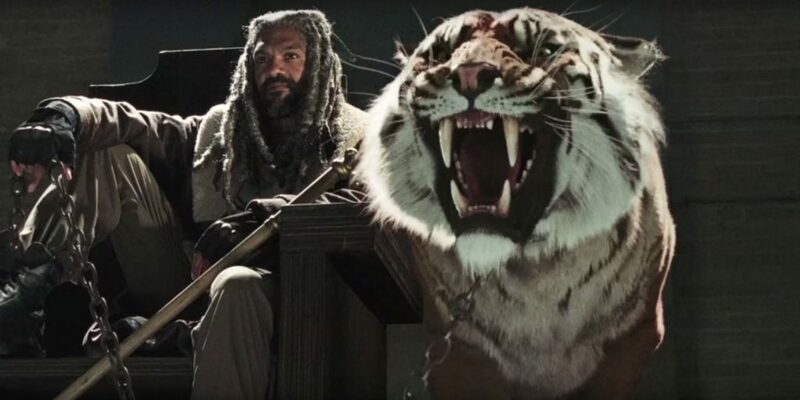 For those of you sick of every leader being either corrupt, crazy or Rick, Ezekiel should be a breath of fresh air. There is a community there and the man in charge is somebody who embraces in some ways some of the more nonsensical parts of life. You know, he walks around with a classical royal air and yet there’s something very affirming about that. It’s theater. He’s a bigger than life character and they’re living in a way that is very affirmative of life and it’s very different from any of the communities that we’ve seen before. The Walking Dead’s next season begins October 23 on AMC.